My (Evan D. Taubenfeld speaking) younger brother is graduating from college (Berklee) and i want to get him a 1x12 combo from your line of stuff. I'm thinking your SJT 10/20 but he is a jazz/blues with an edge type of player and i think he may need a little more clean headroom and then maybe the potential of getting more aggressive at lower levels as well. Can you make him something more like in the 30 watt range that can go to a half power mode more like a late fifties tweed like amp for smaller duties? We start with the basic SJT 10/20 format and first change the entire back end of the amplifier, both the circuit and the output iron and choke to accommodate using a pair of KT 66s, and KT 66s specifically because they produce a really nice American amp style of clean with more of a glassy/shimmery type of high end and when driven a more creamier, content rich type of overdrive not able to be produced by a standard 6L6GC type of tube. Next make a power tranformer, that when tube rectified, produces the precise amount of B+ voltage to achieve 30 watt approximately with a pair of KT 66's in a Class AB1 mode and in a Class A mode take the current draw necessary to support that mode as well. We keep the reverb and dampening switch and the speaker of choice is a Celestion Vintage 30 chosen for both the sound it produces and it's power handling capabilities. What you get at the end of the rainbow is one of Divided by 13 most versitile amplifiers to date. 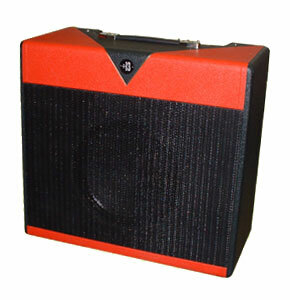 With almost unlimited capabilities it captures a perfect merger of classic American and British cleans to overdriven tones and voicings and all in a relatively small and portable 30 watt 1x12 combo again inspired by a player (thanks Evan) that is asking us to take him where he wants to go.